NOW: A block full of neon-announced retailers has been since replaced with another of the Central Business Districts big scrapers, the U.S. Bank Center. In 1933 the Pike Street Theatre opened with a fine Art Deco façade topped, incongruously, with clumsy roof supports for a grand sign. It closed as the Town Theatre in 1986, but for most of its life it was, as the sign says, the Roosevelt. Hanging inside to either side of the stage were large portraits of Franklin and Teddy – the presidential Roosevelts. The likely date here is 1941. That spring the features playing in the Roosevelt’s double bill were both released. (If you are thinking of renting the video, “The Devil and Miss Jones”, a romantic comedy with Jean Arthur, Robert Cummings, Charles Coburn, and Edmund Gwenn has got much better reviews than “Model Wife.” Also for 1941, the Chevy’s rear end on the far left has that year’s curves. In the 1941 city directory there are 44 motion picture theatres listed. Most of them – twenty-six – are out in the neighborhoods. As expected most of the downtown theatres are at its north end with the big retailers. Within three blocks of the Roosevelt, at 515 Pike Street, are nine others: the Blue Mouse, Capitol, Coliseum, Embassy, 5th Avenue, Music Box, Orpheum, Colonial, and Winter Garden theatres. If I have figured correctly, only the 5th Avenue survives – a venue for touring stage shows. On this south side of Pike between 5th and 6th Avenue we find in the directory’s continuous street listings nine retailers. For “old time’s sake” we will name them starting at the 5th Avenue corner with Friedlander Jewelers and continuing east with Staider’s Delicatessen, Coast Radio, Michael and Coury Men’s Furnishing, Burt’s Jewelry Store (here just right of the Roosevelt,) Anderson’s Confections, and the once very popular Green Apple Pie Restaurant. Like McDonalds with hamburgers The Green Apple kept updating their sidewalk sign with how many pies they had sold. The Brewster Cigar Company completed the block. Great photo! We are once again indebted to Lawton Gowey. 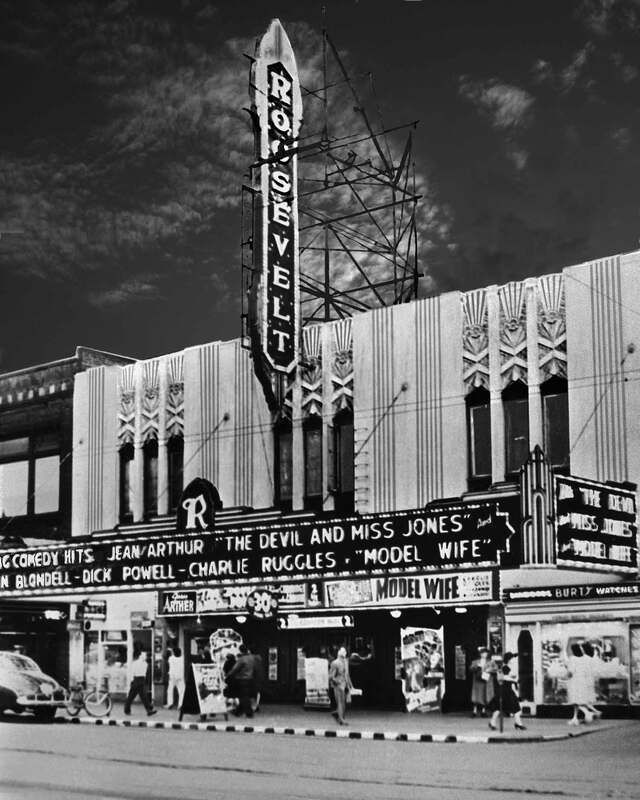 Designed by architect Henry Bittman, the Roosevelt is another theater whose slow decline into obscurity has left it all but forgotten today. The films shown on the marquee were both released in April 1941, The Devil and Miss Jones on 4/11 and Model Wife on 4/15, Jean Arthur was a real doll! She began her career with the great John Gilbert in Cameo Kirby (1923), directed by no less that John Ford! You may also recall a Frank Capra picture she made with Jimmy Stewart, Mr. Smith Goes to Washington (1939). She was also a 1929 Wampas Baby Star. While the Roosevelt is just beyond my bailiwick of silent era film and theaters, all of the other houses you mention were built during that period. The grandly appointed Coliseum Theatre (5th and Pike), which survives today as a Banana Republic store, began its long run in January 1916, Opened as Pantages in July 1915, the theater at 3rd and University, renamed Rex by the Roosevelt’s opening and Palomar by the date of this photograph, also falls within your three-block radius. Seattle’s Metropolitan Theatre (1911-56) was located within 1/2 block of the 5th Avenue on the south side of University Street, at what is now the porte-cochère entrance of the Olympic Hotel. Primarily a Vaudeville house early on, the Pantages saw increasing use as a movie theater in later years and was demolished in the summer of 1965. The Metropolitan presented ‘legitimate’ theater and screened films only on rare occasions. The Fox Theatre (1929-92) at 7th and Olive, renamed Roxy five months before the Roosevelt’s September opening, was promoted as Seattle’s first ‘all singing, all talking, all dancing’ movie palace. Today it is best remembered as the Music Hall. Opened as the Class A in October 1911, the Capitol changed to an all-newsreel format and was renamed Telenews in 1941. Following years of adaptive reuse, lastly as a Winchell’s Donut shop, the building was razed along with the former Colonial Theatre on the opposite side of the block, for the Century Square office tower in the early eighties. If the distance from the Roosevelt is extended to four blocks, we can include a second survivor, Seattle’s Paramount Theater at 9th and Pine, opened as the Seattle in March 1928. Among Seattle’s most beautiful and popular theaters in the twenties and thirties, the Liberty (1914-54) was located on the east side of 1st Avenue, north of Pike. And don’t forget the Moore! I saw my last film there in 2008. Sadly, my memories of this theater are from its days as the Town, when all or most of the architectural details had been stripped away. The Music Hall, Blue Mouse and Music Box suffered similar fates. If we consider the northeast migration of Seattle’s business district from Yesler’s Wharf and the theaters that followed, the Roosevelt would be the last single screen of any size that was built. What a splendid elaboration. Thanks very much, and I learned more than something. I learned a lot. Before getting into my defense of the Town theater, I’ll get a little nit-pickey with Mr. Jeffers, whose otherwise invaluable contributions are compromised by a rather deficient sense of geographical mathematics. 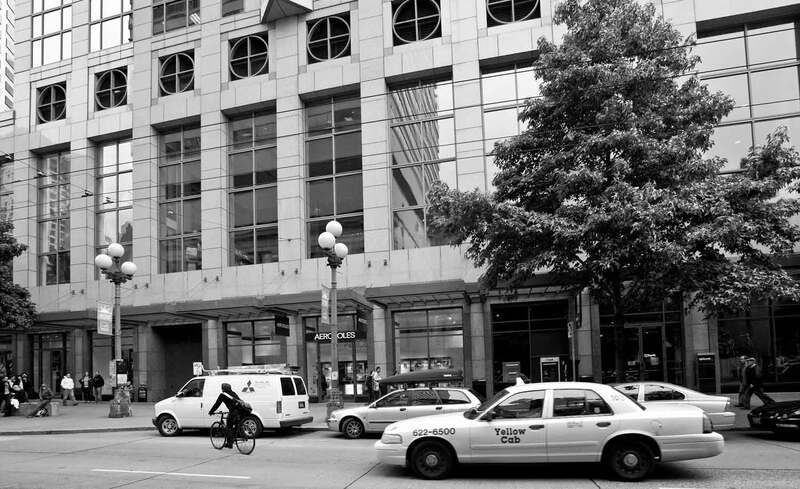 3rd and University is four blocks from 5th and Pike, outside the 3-block radius specified by Mr. Dorpat, and 9th and Pone is 5 blocks from 5th and Pike, disqualifying the Paramount from inclusion in Mr. Jeffers’ expanded perimeter. That bit of nerdish nitpicking now fulfilled, I’ll get on to the primary reason for adding this comment. As one must surmise from these titles, the Town was a hot venue through the seventies, while across the street, the Coliseum went to seed both in the auditorium and on the screen, with low-grade action films playing to an increasingly derelict cliental. The town started to go downhill after “Apocalypse Now,” and ended as an eyesore, but it surely deserves to be remembered, not only for its vintage days as the Roosevelt, but for the two decades of quality entertainment it offered as The Town. One night that will remain in my memory is the time I was standing in a long line at the Coliseum to see “Valley of the Dolls” (by co-incidence I was there with Paul Dorpat’s sister-in-law and niece) when a bunch of people exiting The Town told us we were making a big mistake waiting to waste our money on a piece of junk like that when we could cross the street and see a jewel of a film called “The Graduate” without standing in a line at all. David thanks you, I thank you and both my niece Joanne and sister-in-law Klarese (if she were yet alive) thank you. We also show gratitude to the “bunch of people” for they were, I think, correct in favoring “The Graduate” over the “Valley of the Dolls.” You did not tell us if you took the advice. And finally I thank you for sending a picture of the Town borrowed from a theater-related web whose name is embedded into it or stamped on it. Now I will try to figure out how to import that picture as an “edit” to the story itself. Keep writing that narrative of your life-and-times with local theaters. Thank you for the post. It brought back a memory of the first time I ever went into the Coliseum Theater, which happened to be the last night of its life. And it did not go gentle into that good night. The movie “Tremors” was the last movie to play at the Coliseum before they shut it down, and a friend and I went to see it in the vast and ornate space. We had it practically to ourselves. The movie was great — Fred Ward and Kevin Bacon in a monster worm movie that was surprisingly funny and surprisingly tense. I still recommend it as one of my favorites. I’m glad I got to see at least one movie in there before the flag of the Banana Republic was hoisted above it. I study history. Bill lives it. He’s also older and has better stories. Regarding the 5th and Pike Coliseum, I do have one good, if embarrassing story. My first visit to that theater was to see Dino DeLaurentis’ King Kong in 1976, a ridiculous movie. I returned 31 times to see the same film! For years I didn’t understand why. Discussing this with Bill a few years ago, I realized it was the theater, not the silly, animatronic monkey. are you sure it was just the theater? for one reason and one reason only. i hadn’t seen glamour like that on the screen since grace kelly.